Rhesus macaques are one of the most commonly utilized non-human primates in biomedical research. They are employed in numerous research areas, such as immunology, neuroscience, oncology, infectious disease, and toxicology due to their physiology. Rhesus monkey bone marrow cells can be used for a wide variety of safety assessment and functional studies. They are commonly employed in pre-clinical settings to ensure biologics are not eliciting unwanted effects or functions on the different cell populations of the bone marrow. Bone marrow cells are also utilized to test the toxicity of compounds on these cells. Additionally, rhesus bone marrow can be used in ex-vivo applications for cell population characterization. Rhesus monkey bone marrow cells can also be used to generate mature monocytes and macrophages from progenitor cells in the marrow. These cells are then typically used in co-culture assays with other immune cells to assess their function. 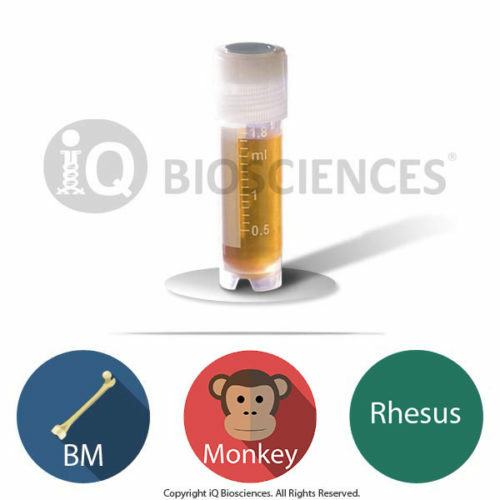 Bone marrow from rhesus macaques is collected responsibly at third party facilities. These facilities are vetted to ensure they operate according to local regulations and laws. Since the facility is local, the marrow is quickly transported to iQ’s facility for processing. At our facility, bone marrow is carefully removed from the tissue and mechanically dissociated to obtain a single cell suspension under sterile conditions. The suspension is carefully passed through a filter to remove any aggregates and subsequently depleted of red blood cells. The bone marrow is then frozen based on iQ Biosciences’ quality-controlled cryopreservation protocol to promote recoverability and viability once in the end user’s hands. The rhesus macaque bone marrow cells are cryopreserved carefully using iQ Biosciences’ cryopreservation protocol that ensures high viability (typically > 80%) after thawing. Cells should be stored at < -120°C once they are received, such as within a liquid nitrogen tank (vapor phase). Interested in learning more about this Cellular Product? Complete the form below to request a Fact Sheet. iQ Biosciences’ primary cell products from non-human primates are collected under approved IACUC protocol, which was developed in consultation with the Attending Veterinarian and is consistent with current veterinary standards. The collection facility is AAALACi and PHS accredited, and all animal housing, handling, and research protocols are consistent with standards set forth by the Animal Welfare Act, NIH's Policy on Humane Care and Use of Animals and the Guide for the Care and Use of Animals. All animal housing and handling is done in such a way to minimize stress and risk of injury to the animal. Your research is important to us. Our scientists will work through each step of the process with you, including assay design, data analysis, and recommendations for future studies. Simplify your workflow. Bypass the middle-man: at iQ Biosciences, you'll get immediate access to our biospecimen inventory, saving you both valuable time and money. We're experts- so you don't have to be. Augmenting years of experience in immunology and working with immune assays, our scientists stay current with the latest publications and technology. We're here to help. We know the challenges you're facing: whether it be through expedited service or our complimentary consulting services, our team is dedicated to helping you reach your goals. For US customers, we ship via FedEx Overnight Shipping. Shipping charges will vary per shipping address (based on ZIP code) and are estimated to be $110. For international (non-US) customers, we work closely with you and our couriers to ensure all necessary documentation is in place for international shipments to significantly reduce the chance of delays at Customs. For the export of non-human primate samples, this includes preparing CITES permits, as well as any other documentation as required by country. 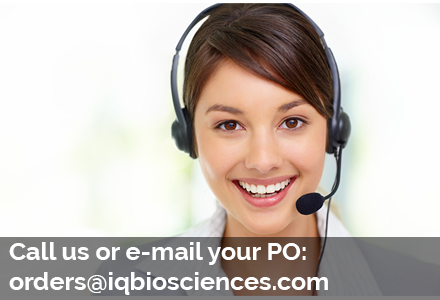 Please submit an inquiry to orders@iqbiosciences.com for your estimated time of delivery and shipping charges.